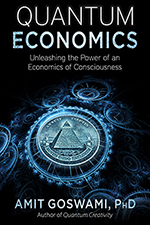 Please enjoy an excerpt from Dr. Amit Goswami’s latest book, Quantum Economics: Unleashing the Power of an Economics of Consciousness. In view of the recent meltdown of the economy that gave rise to the great recession, it is pretty obvious that the current economic systems are not working. But economists don’t have a clue about which way to go about modifying the existing models. The two political parties of America are bogged down into a locked-horn position between two existing and decidedly ineffective economic modalities: choosing solely from either the demand side or the supply side economics model for government intervention to get us out of recession. Meanwhile, every economist seems to accept that there is only one way to get back into healthy economy: a forever-expanding economy fed by consumer demand. Adam Smith’s capitalism,the basic economic model in most of the world today, was formulated in an age dominated by the philosophy of modernism or Cartesian dualism in which both matter and mind were valued. However, like all scientific theories, Adam Smith’s theory of capitalism underwent many modifications. Some of the modifications that occurred were politically motivated, as was the case with the so-called demand-side and the supply-side economics. Along with political pressures another set of modifications took place as well, this time because the scientific worldview gradually was becoming lopsided, favoring matter while excluding the independence of the mind. Eventually,modernism passed its beacon to post-modern scientific materialism(primacy of matter philosophy), and this led to some serious modifications to Adam Smith’s capitalism. One of these modifications was that economics was recast as a mathematical science. But this is only approximate at best despite the claims of scientific materialists (after all, as we experientially know, human beings are not mechanical machines). So this model, although successful in the short run in making a lot of money for its protagonists, fails in the long view; this is one of the major contributors to the meltdown of 2007-2009. Another shortcoming resultant of the materialist modification of capitalism has been duly noted; it has left us with the idea of infinitely expanding economy—expansion or bust—entirely fueled by consumer demand. However, in view of our finite planet and the finiteness of its material resources, this theory demands the question: is this sustainable? Meanwhile, there is a paradigm shift going on in science from a matter-based science to a consciousness-based science, from primacy of matter to primacy of a causally empowered consciousness. 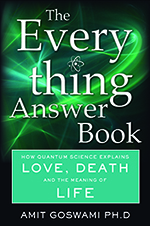 My current undertaking—this book—is the result of a developing quantum worldview that is quietly replacing the worldview of materialist physics. I was at a conference in 1999 with the Dalai Lama as a member of a group of thirty new paradigm scientists when the Dalai Lama challenged us to apply our new science to social problems. This personally inspired me to look into economics. But I was sidetracked by other social problems. It was only when coincidentally several years later I had a call from the president of the World Business Academy, encouraging me to write an article on the impact of the new paradigm on economic thinking, that my attention turned firmly to that subject. I realized early on that in using the primacy-of-consciousness formulation of science, the power of the subtle (psyche) could be recognized, organized and realized. This relatively recent break- through in our understanding in science states clearly that it is not only our gross material experiences that can be subjected to the scientific process but also our internal subtle experiences (that which we sometimes collectively call the arena of the mind) can be subjected to this testing as well. Why not expand economics to the subtle arena—to the arena of vital energy that we feel, of mental meaning that we think, and of even archetypal values like love that we intuit? Sounds too preposterous? But didn’t the great Abraham Maslow propose a hierarchy of needs? When our material needs are satisfied, we yearn for higher needs like love, said Maslow. Adam Smith’s capitalism is about matching gifts and needs, which give rise to production and consumption respectively, the two sides of the economic equation of supply and demand. Maslow says that the need for the subtle is already there. My research shows that our science and technology are ready to tackle the gift and production of the subtle. The time has come for an economics of consciousness—quantum economics! This book is a direct expansion of my earlier papers solving the remaining problems of Adam Smith’s capitalism and thereby resolving all the current economic plights. Of course, like the consciousness-based science, this new economics is not going to be immediately embraced. But since it involves the solution to all the pocketbook problems of economics, as well as environmental and sociological problems, obviously its time has arrived. What is the new economics good for? It is good for resolving all four issues raised above and then some. 1. The new economics takes economics to satisfying the subtle aspects of human needs, in this way discovering new infinite dimensions of economic expansion. Satisfying subtle needs produces a transformed human society in which sustainable economies are quite conceivable. And more. As mentioned above, the new economics gets rid of the business cycle. 2. The quantum worldview is counter to elitism, and in this way, an economics founded on the principles of this worldview will bring down the wealth gap between rich and poor and more. It will eventually solve the poverty problem as far as that can go. 3. Neither the materialist worldview nor the religious worldview before modernism promoted creativity much by their very nature. The materialist worldview is deterministic; not much scope for true creativity is in it. The religious creativity denigrated the world. It could have been creative in the exploration of spirituality, but had lost itself in rituals and traditions. The modernist worldview brought creativity in the world like never before until it dried up under the current materialism. The quantum worldview is theopposite—it promotes creativity. So with it help, creativity and innovation will come back once again in the arena of economics. 4. The political polarization will not affect economics any more. Democrats like science. The new economics is science based. Republicans side with Christianity, which is implicitly based on spiritual values. The new economics promotes these values by making values into economic commodities to produce and consume. In this way quantum economics shouldgain support from both camps. And more. The quantum worldview integrates. Eventually, the political polarization itself will stop. The book is written for both the businessperson and the consumer, in other words, everyone. It touches upon important issues like creativity and ethics in business. It takes you into the already feasible twenty-first century technologies of vital energy. It informs everyone in a developed economy that the time has come to look for jobs that bring meaning and value into their personal lives. It gives quantum hints for new business leadership: a viable science of manifestation, how to vitalize their business arena, how to transform the energy of money. I thank the Dalai Lama for the initial inspiration and acknowledge a wonderful discussion with Swami Swaroopananda toward that end as well. Thanks are also due to Rinaldo Bruttocko for his invitation to join the World Business Academy. I thank many people for helpful discussions, especially Willis Harman, Paul Ray, Adriano Fromer Piazzi, Maggie Free, and Eva Herr. Last but not least, my heartfelt thanks to Will Hamilton for a complete reading and many helpful suggestions for improvement for which I am truly grateful.